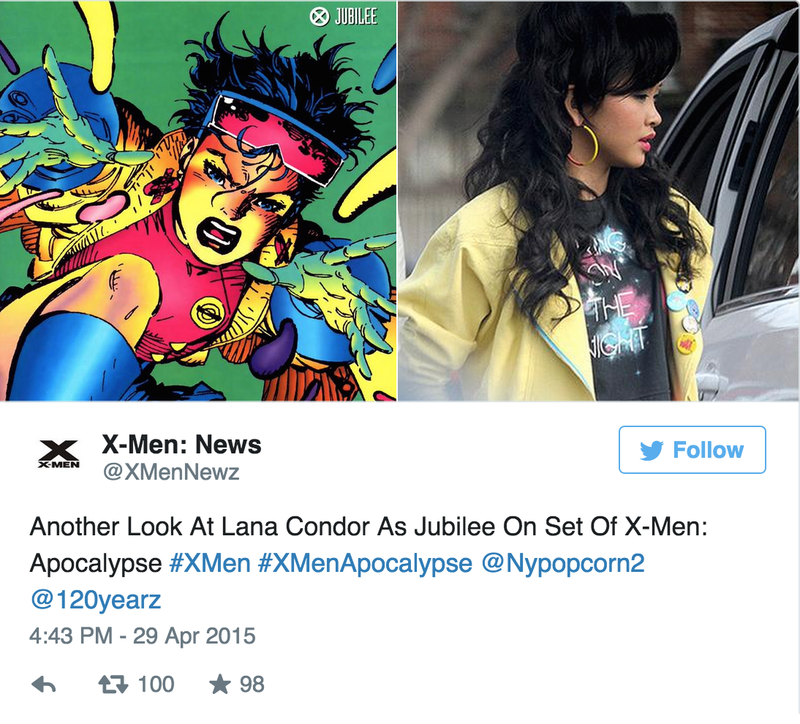 We couldn’t contain our excitement last month when X-Men: Apocalypse director Bryan Singer revealed that newcomer Lana Condor would be playing the teenage mutant, Jubilee. Although Jubilee was a popular character in the 90’s X-Men comics as well as the animated television show, she barely made an appearance in the previous X-Men films. It seems the tides are turning and we definitely have high hopes for a bigger Jubilee presence in the films with Condor now on board. And even more exciting is to actually see it all come together. 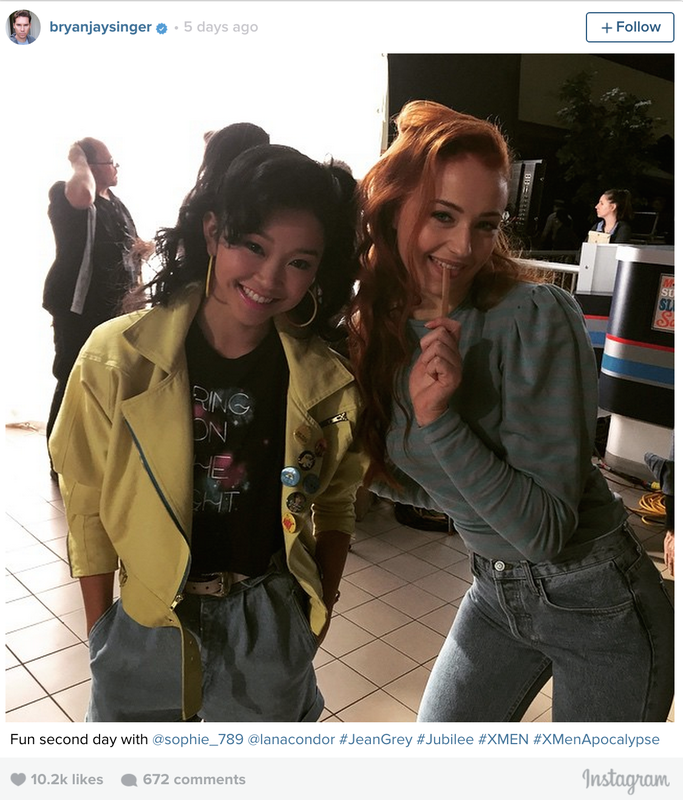 Filming for X-Men: Apocalypse officially began last week and thanks to social media, we were lucky enough to get a look at Condor dolled up in Jubilee’s trademark yellow jacket and the bright colors of 80’s fashion. Condor also seems to have picked up a familiar face as a friend. Sophie Turner, most known for her role as Sansa Stark in HBO’s Game of Thrones, has been casted in X-Men: Apocalypse as Jean Grey. It’s truly hard not to be excited seeing the two of them interact. 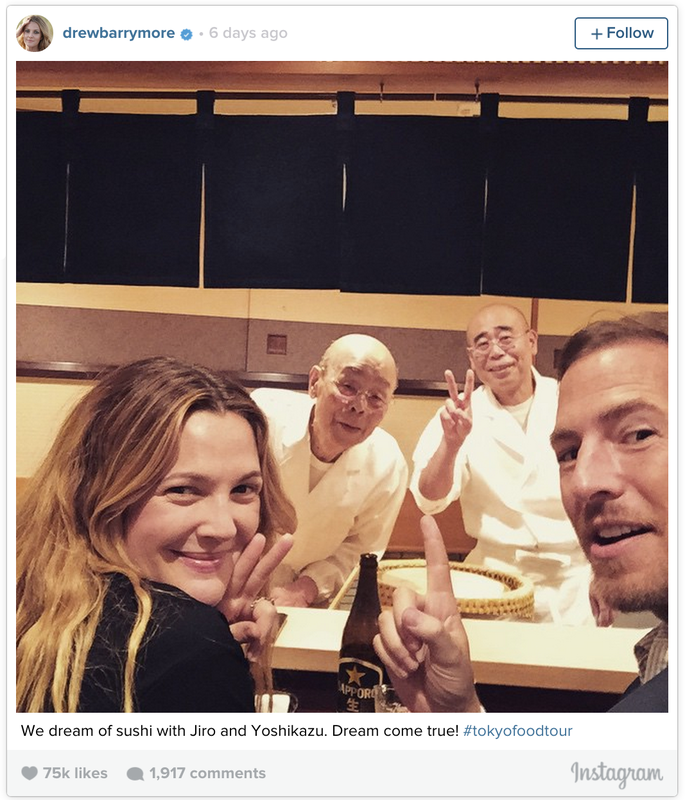 Drew Barrymore is in Japan right now, and while we’re sure she’s got some sightseeing and interviews on her schedule, what she seems most fired up about is the food, as the actress looks to be on a mission to sample all that Tokyo has to offer her taste buds, from cheap ramen joints to Michelin-ranked fine dining. 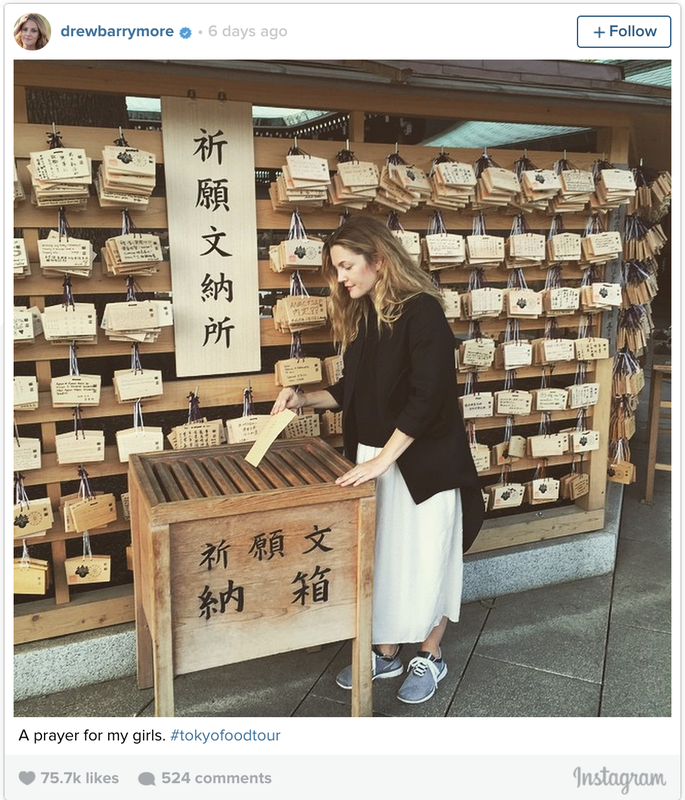 Barrymore has been chronicling her culinary exploits through her Instagram account, marking updates with the hashtag #tokyofoodtour. 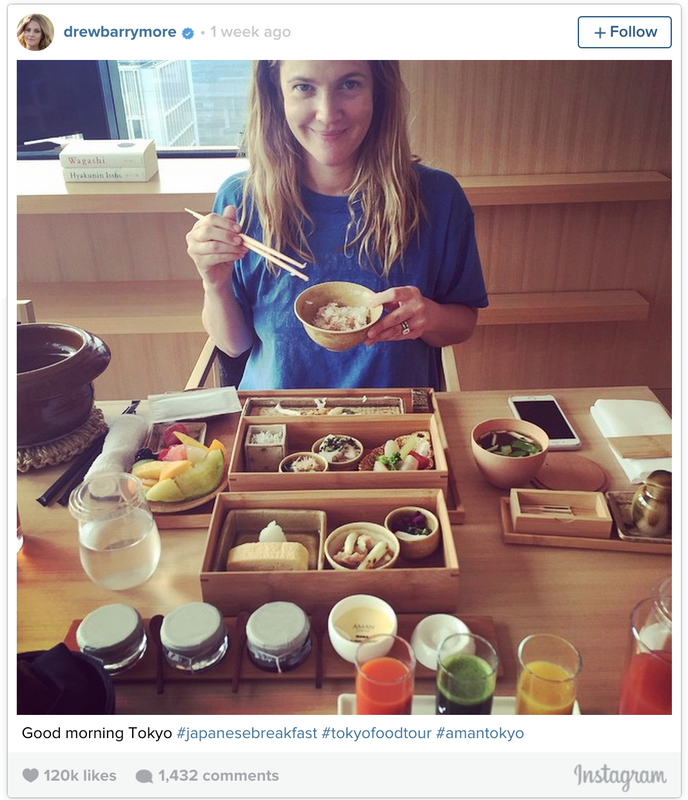 The very first entry shows the star looking a little sleepy as she poses, chopsticks in hand, behind a balanced and beautifully arranged Japanese breakfast. Next up, a stop by Sukibayashi Jiro, made famous by 2011 documentary Jiro Dreams of Sushi. 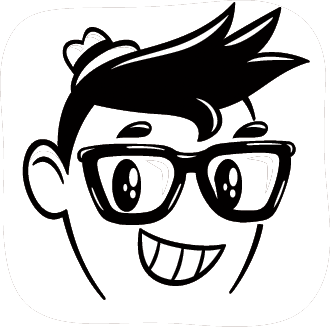 ▼ The famously strict Jiro even cracks a smile. 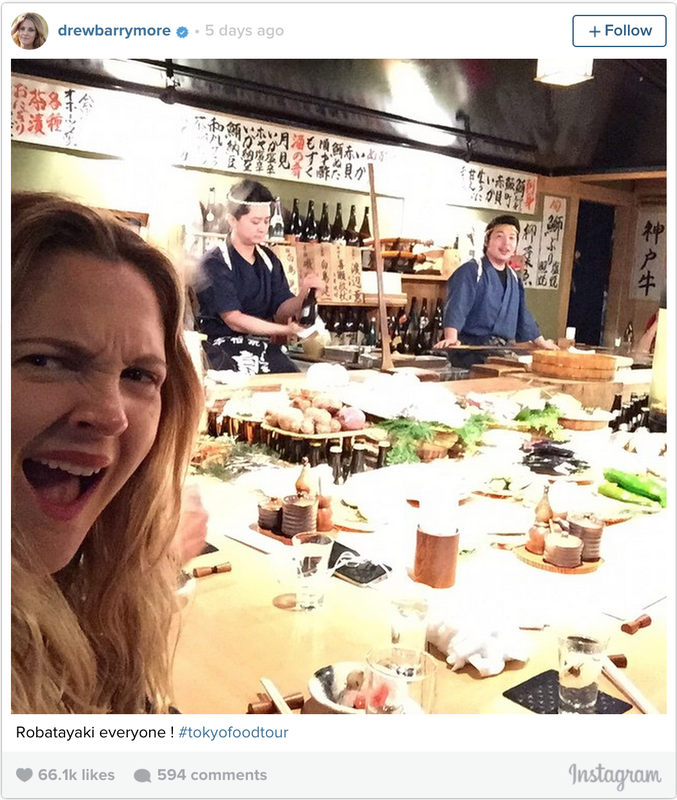 The actress isn’t solely interested in such exclusive establishments, though. 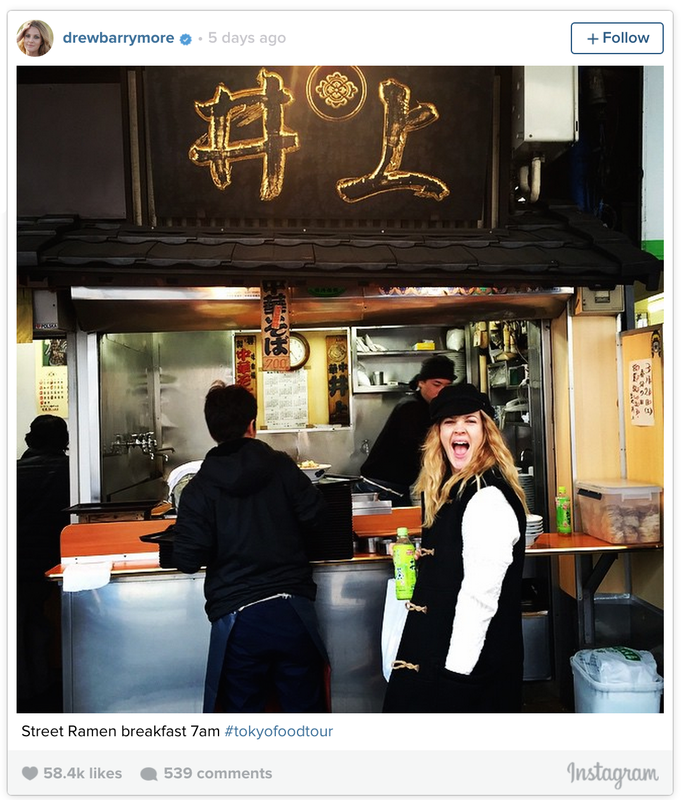 As a matter of fact, she was up at about at 7 a.m. to stop by popular ramen restaurant Inoue, located in the Tsukiji neighborhood. 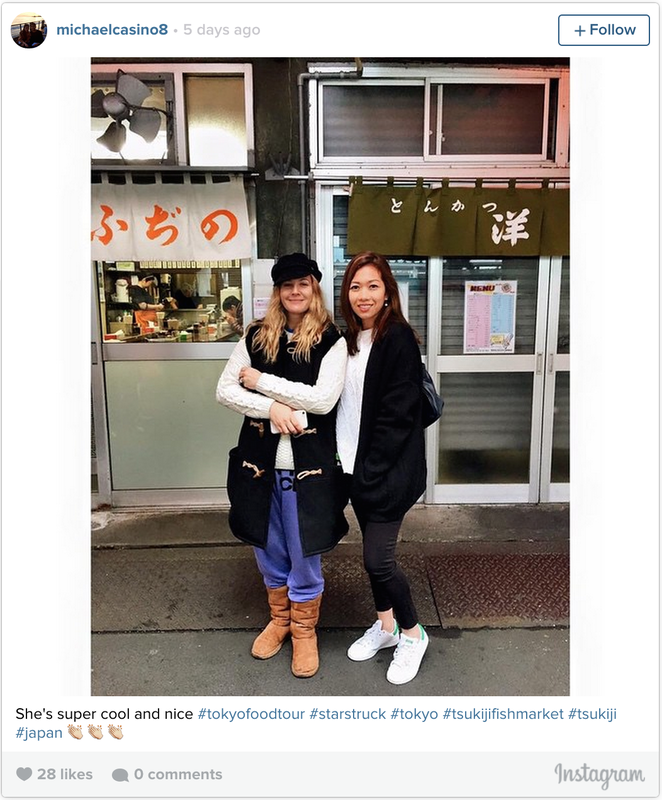 …plus took time to pose with a fan. 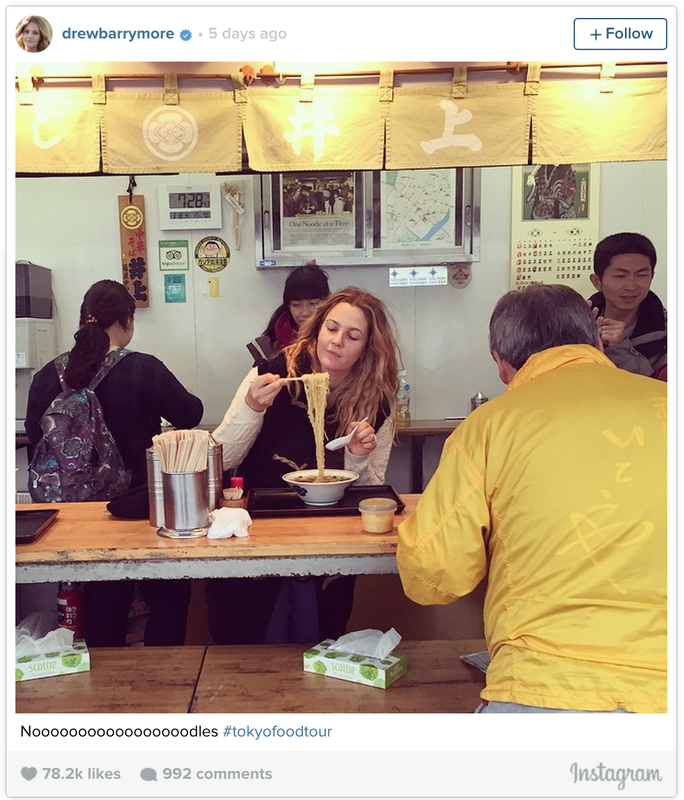 Japan doesn’t just have a deep food culture, though. 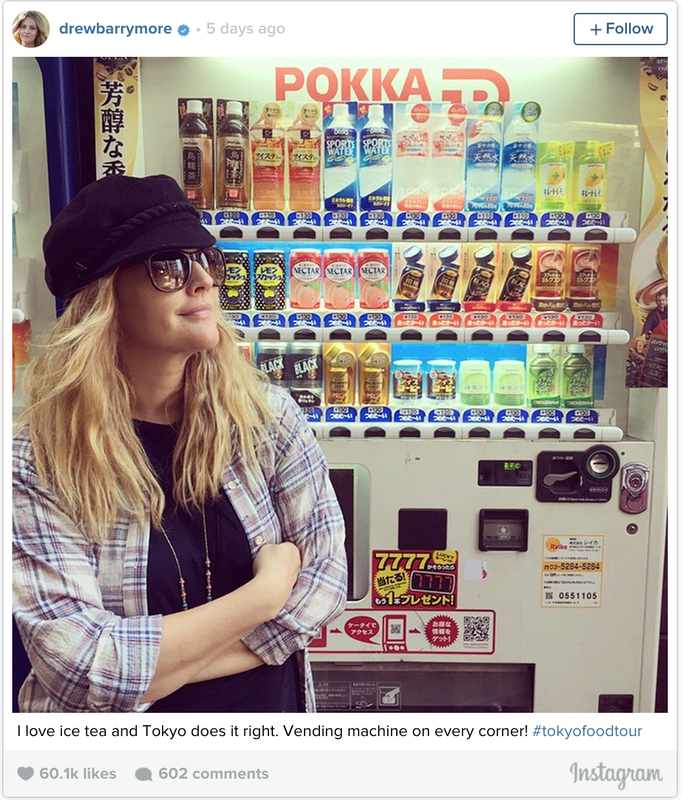 A walk through Tokyo will present you with a staggering amount of beverage options, many of them waiting for you inside the city’s ubiquitous vending machines. 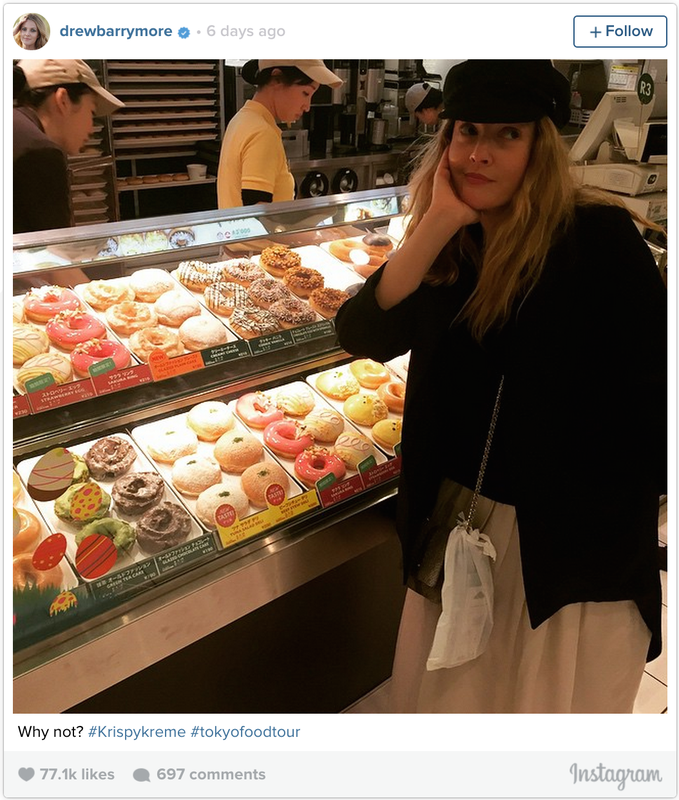 And, like a true foodie, Barrymore remembers to save room for dessert, which on this day came from a Tokyo branch of American donut chain Krispy Kreme. A drone is an aerial vehicle which can fly around without a human pilot aboard. Instead, this aircraft is guided remotely. Now I don’t know about you, but nothing about remote airplanes scream “romantic” to me. Well, it seems Zhang Ziyi’s boyfriend Wang Feng intends to change that. Zhang Ziyi, the Chinese actress most known for her roles in Crouching Tiger, Hidden Dragon (2000), House of Flying Daggers (2004) and Memoirs of a Geisha (2005), just celebrated her 36th birthday. Her boyfriend Wang Feng, a Chinese rock musician, decided that she needed much more than a rainbow cake to celebrate her birthday. Pictures have made it onto the internet showing a small, white drone flying towards the couple. Wang Feng apparently reached into the basket hanging from the drone and pulled out a diamond ring before getting down on one knee and asking for Zhang Ziyi’s hand in marriage. According to Chinese media, Wang made a promise to take care of Zhang even in old age. The two then embraced and kissed as fireworks lit the sky. 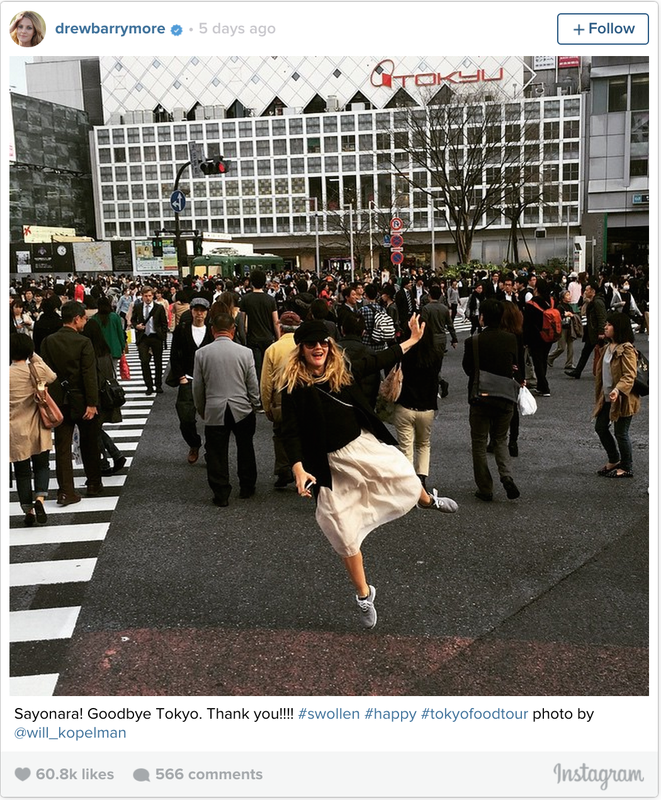 Needless to say, fans are delighted with the extravagant proposal. Even after seeing our fair share of unique marriage proposals, a drone proposal is still a rare sight. So tell us. Is a ring-bearing drone cute or way too over the top?